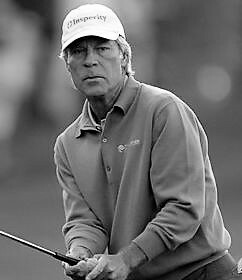 Although some professional golfers have won more major tournaments and others have collected more in winnings, Ben Crenshaw remains after forty-two years on tour, one of the most popular and talented players on the grueling PGA circuit. His all-American looks, charisma, and grace under pressure have made him a gallery favorite from his days at the University of Texas, where he was heralded as the next Jack Nicklaus, to the 1984 Masters Tournament, where he ended a decade of frustration to capture his first major championship title. His second victory at Augusta in April of 1995 secured his place in golf history. Throughout his career, Crenshaw has captained the victorious 1999 U.S. Ryder Cup Team, has been a 4-time member of the U.S. Ryder Cup Team, became 1984 and 1995 Masters Champion, has accumulated 9 PGA Tour victories, has received the highest honor the United States Golf Association bestows as the recipient of the 1999 Bob Jones Award, and is a 29 year Tour veteran. Crenshaw, a native Texan, attended the University of Texas and still resides in Austin with his wife, Julie, and daughters Katherine, Claire, and Anna Riley.